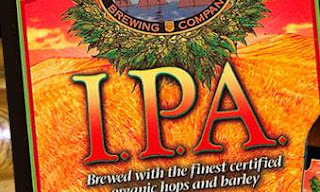 The Eel River Organic IPA is better than your typical IPA. It has strong hop character that is complemented by a smooth fruitiness. Despite a 7 % ABV, you do not feel like you are drinking an alcohol heavy brew. I am sure that since the beer is made from organic hops, that appeals to people, not me though. What is appealing to me is the taste which this beer is full of. The Eel River IPA gets a 3.5.